Dermatologists recommend for people who experience hair thinning or hair loss to increase their consumption of zinc. Best way to naturally improve hair growth and help prevent thinning is to incorporate zinc rich food like zucchini into your diet. While vitamin C from foods like zucchini boosts your immune system, it also encourage your body to absorb iron, a mineral necessary for hair growth, and help produce and maintain healthy collagen, a component that keeps your hair follicles healthy. According to the University of Pittsburgh Medical Center, vitamin A deficiency is linked to dry hair, and if hair suddenly starts falling out, or becomes weak and brittle adding food sources of vitamin A, like zucchini, to your diet, may improve the condition. If you mix 2 tablespoons of grated zucchini with 1 tablespoon of oatmeal, you’ll get an excellent DIY homemade zucchini face mask for oily skin. 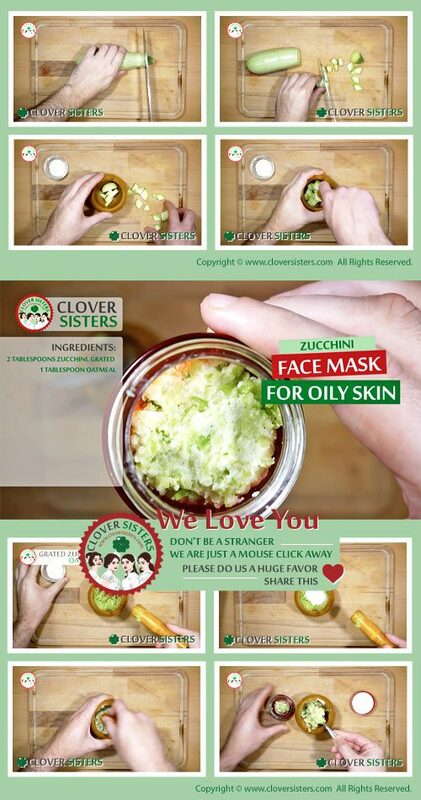 This mask will remove the excess oils and the impurities from your pores.